Carole's Chatter Blog Tips: Do you find it harder to comment using your iPad? Do you find it harder to comment using your iPad? I don't know about you guys, but I find it much slower to make comments when I am on the iPad rather than my pc. The little virtual keyboard just doesn't do it for me - I can't touch type on it. I have found one thing that helps me if I need to comment by iPad - my preference is still to do comments on the proper keyboard. Then scroll down til you find a heading Keyboard (it's between Date & Time and International) - touch that line and you will see the heading Shortcuts. 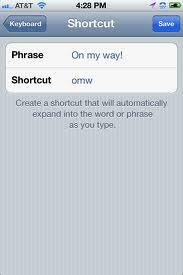 And a line "Add New shortcut". Then every time you type hag the phrase Have a great day! will pop up and you just confirm it by pressing return on the keyboard. One warning - don't make your shortcut a word that you will use in other contexts! If you do, you will soon find out that your phrase pops up when you don't want it! What a great idea. I haven't tried leaving comments from my Ipad yet, but it's only because I'm not real familiar with it. I will definitely save this tip. Thanks! and thanks for the warning. I can certainly see that happening. I learnt something new from you. Thanks! while I like my ipad-I am not fond of typing on it. Would you like to create something like this? I was an accidental No-reply blogger. Are you? Would you like a custom signature for each post?